Some of us were lucky enough to have moms or dads build treehouses for us – for the rest of us, there’s Benjamin Jones. 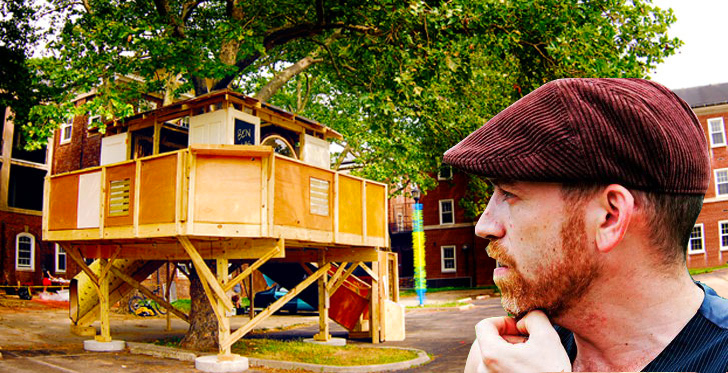 The artist recently brought his colorful TreeHouse made of sustainable materials to Governor’s Island in NYC for the annual Figment Festival and it was an instant hit with kids and adults alike! We wanted to know more about the inspiration behind the arboreal home’s recycled design so we caught up with Benjamin to ask him everything from where he sourced his supplies to what cool interactive art projects he’ll be hatching next. Read on to see what he shared with us – including the real reason he decided to go for building the treehouse (read: a girl)! Inhabitat: What was your inspiration for the TreeHouse? Benjamin: I was actually asked by Figment to do the TreeHouse, the Governors Island people had suggested it and Figment came to me, because I had done work there in the past. I was excited to do it – who wouldn’t want to build a treehouse of their dreams? However, I was unsure about it because of grad school. How was I going to get through thesis semester and build a huge treehouse?Well, I had just started dating someone at the time, and I thought it would really impress her to build her a treehouse. So, I figured out a way to both do grad school and a treehouse by combining the two. Inhabitat: Why did you choose to work with recycled materials instead of simply going to Home Depot and purchasing new lumber? Benjamin: Many reasons. First, I’m the son of an antique dealer, so I grew up around junk, well expensive junk, so I’ve always had an affinity towards old stuff. There’s a certain quality about old wood that you just can’t get with the new stuff. Second, I started working with reclaimed stuff because I was broke, I needed materials and collecting junk off the street seemed like a good place to get it. Plus, when you’re a kid and you’re building a treehouse, you use what you can find and drag it out to the woods. You don’t go to Home Depot. Last, it’s just better for the environment – why use a new thing when something already exists that will work? Note: the whole structure wasn’t reclaimed material. The major structural stuff was FSC rate lumber. New, but sustainable. Inhabitat: Where did you gather the materials for the TreeHouse? Benjamin: The street. I’m always looking in the garbage for good materials. My neighborhood (Crown Heights) seems to be a great source of stuff that people just throw away. I check for bed bugs of course, and have a steamer I use to make sure it’s not an issue. I also sourced a lot of stuff from Build It Green! NYC. They are a non-for-profit re-seller of reclaimed materials. It’s a great source for any kind of construction material and some really cool stuff. I sourced all the doors from BIG, a total of 35 doors in total. Inhabitat: Many people think that working with recycled materials is much more difficult than working with new. Was that your experience? What were some of the advantages to working with recycled materials that people might not realize? Benjamin: Not recycled, reclaimed. It is a little tougher to work with, it’s not all standard sizes and sometimes the piece you thought would work somewhere doesn’t. So you change this or that to make it work. I think the main advantage of reclaimed materials is cost. It’s a lot cheaper to use discarded things than new ones. The second is aesthetic. Old furniture and hardware have certain je ne se quoi about them. If the walls of the treehouse were plywood or drywall, it wouldn’t look nearly as cool. Inhabitat: What are some of your favorite places in NYC to shop for used/secondhand/reclaimed materials? Benjamin: Build It Green! NYC. Also, stoop sales and the garbage, of course. Inhabitat: What is your favorite part of the TreeHouse? What was the most difficult part? Benjamin: Favorite part? The tree. If it didn’t exist it wouldn’t be a treehouse. I’ve spent a while in the treehouse just contemplating the tree itself. It’s a beautiful organism. Most difficult? The slide – it’s closed right now since I need some extra money to really make it work correctly. 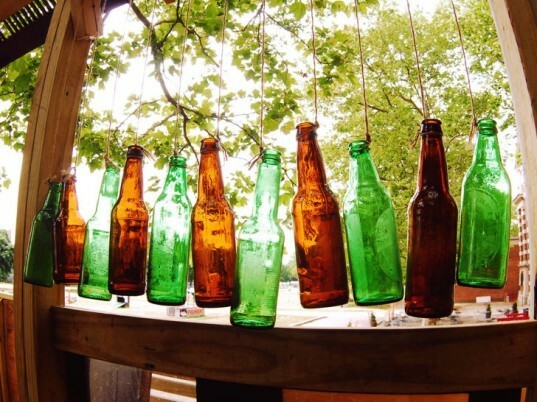 Inhabitat: What advice can you give to artists who want to work with recycled materials? Benjamin: Don’t be rigid – have an idea of how it’s going to look/work. But realize you can’t always find that perfect piece. Or be patient – if you need that exact piece it might take a while to come to you. Inhabitat: What can we expect next from Benjamin Jones? Benjamin: Hmmm, I’ve been thinking about series of forts. Nothing big, like the treehouse. But a blanket fort, pillow fort, leaf fort, etc… I used to make them all the time as a kid. Why can’t they be art, too? Some of us were lucky enough to have moms or dads build treehouses for us - for the rest of us, there's Benjamin Jones. 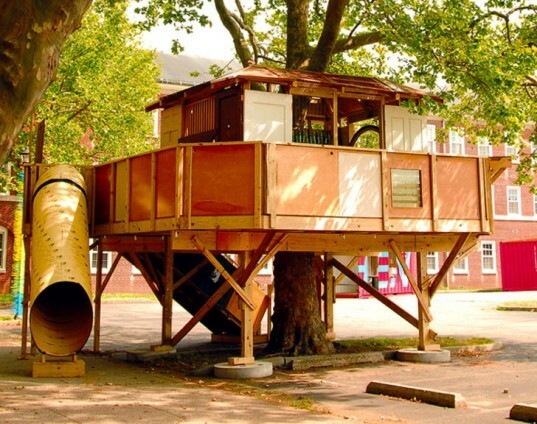 The artist recently brought his colorful TreeHouse made of sustainable materials to Governor's Island in NYC for the annual Figment Festival and it was an instant hit with kids and adults alike! We wanted to know more about the inspiration behind the arboreal home's recycled design so we caught up with Benjamin to ask him everything from where he sourced his supplies to what cool interactive art projects he'll be hatching next. Read on to see what he shared with us - including the real reason he decided to go for building the treehouse (read: a girl)!